have helped generate interest among the general public. In fact, research conducted by The Maitland Clinic found that one fifth of 2,000 men polled think hair transplants are more acceptable thanks to these high-profile endorsements.2 This is perhaps borne out in the numbers of people – both men and women – having treatment, with numbers of surgical treatments carried out in Europe increasing by 45% between 2008 and 2014.3 Dr Ball adds that, in his opinion, the rise of social media and ‘selfie’ culture is, in part, responsible for society’s increasing preoccupation with hair. Fiigure 1: Patient with traumatic alopecia treated with minoxidil and tailored, topical solutions over a period of seven months. Images courtesy of Mandy Baldwin. 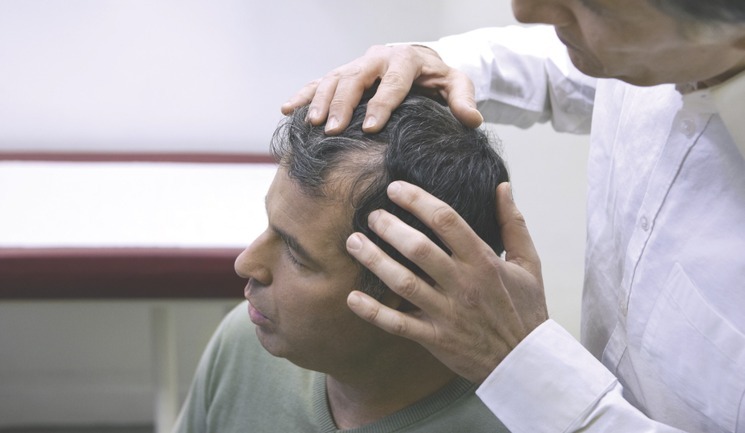 This type of therapy has been the subject of comparatively few scientific studies, but some have demonstrated that mesotherapy can elicit good results in the treatment of acute diffuse hair loss, such as telogen effluvium, stress alopecia, androgenetic hair loss and alopecia areata.14 Patients typically undergo one treatment per month over three months, at which point Cushing would expect to see results. “The greatest limitation is patient expectation,” she says. “You have to be realistic, and some patients can be dissatisfied purely because the change has not been as rapid as they anticipated. Managing expectations is important. Windsor. Images courtesy of Pam Cushing. Dr Somji offers PRP treatment, in which the patient’s own blood is re-injected into the scalp via multiple, tiny injections around 1cm apart. This involves withdrawing blood – usually from the patient’s arm – and processing it through a machine to centrifuge it and separate out plasma containing a high concentration of platelets. This PRP is rich in growth factors – naturally occurring substances that stimulate cell growth and proliferation, and thereby promote tissue regeneration.12 Studies have demonstrated that injecting PRP preparations has a ‘positive therapeutic effect on male androgenic alopecia without major side effects’.13 “First, we do a trichoscopy, looking at the scalp under a microscope for areas of miniaturised follicles,” Dr Somji comments, adding, “We count the number of follicles per cm squared, so we have a quantitative analysis before treatment.” This gives both the patient and the practitioner a measurable assessment of the success of the treatment. An important factor, according to Dr Somji, is the depth to which you inject the scalp. “The length of the hair follicle underneath the skin is different for everybody. People of Indian origin have longer hair follicles than Caucasian people, for example,” he says. As a result, injection depth should be determined by the length of the individual patient’s hair follicle. “I surgically remove one follicle and look at it under the microscope to measure how far it goes down to the papillary dermis, which is where the PRP is injected. That gives me an accurate measurement of how deep to set the needle,” explains Dr Somji, adding, that this is typically between 1.5 and 2.5mm, with 0.5ml of PRP injected per cm squared, but, crucially, the depth is varied from patient to patient, where other practitioners may use the same depth across the board. 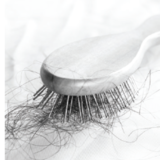 According to consultant trichologist Mandy Baldwin from the Hair and Scalp Clinic, dormant hair follicles start to become fortified and reinvigorated almost immediately. “You can’t see anything straight away but there is lots happening underneath, just like when you plant a seed that eventually grows into a flower,” she says. “Patients normally begin to see a change at around three to six months post treatment.” Moreover, Baldwin adds, PRP can be used in combination with hair transplantation to help the implanted follicles to prosper, reduce inflammation, erythema, trauma, and the formation of scabs, and to aid healing. Figure 3: Patient in his 20s who underwent a single hair transplant surgery using the FUT method to the frontal half, following seven months on oral finasteride (1mg daily). Images courtesy of Dr Edward Ball. 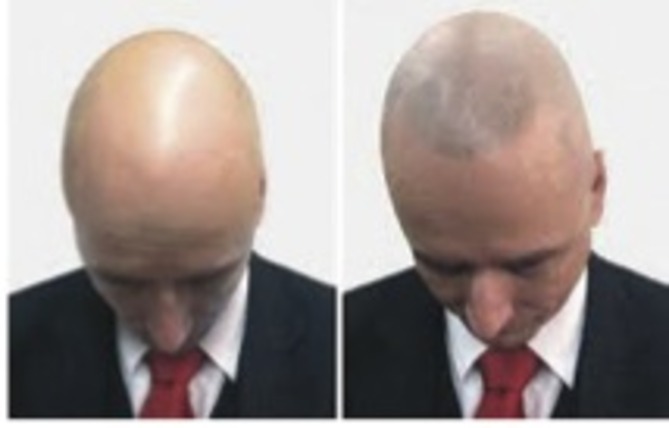 Figure 4: Before and after two sessions of hair follicle stimulation over four weeks. Images courtesy of Natasha Borciani. “I draw on a hairline template with a liner to get an idea of the shape we can work with and what the likely result will be,” Borciani explains. “Then we do some colour matching; we work with a large range of pigments that we blend together to find an exact match that’s as natural looking as possible.” After numbing the scalp for 20 to 30 minutes, the treatment is performed using one of two systems – or a combination of both – depending on the extent of the hair loss and the desired outcome. “The first is a roller system, which allows you to put in far more pigment far more quickly. It reduces the length of time the patient has to be in the chair, which, for a full head, could be from up to five hours down to about 60 minutes.” This roller is applied to large sections of the scalp, and around the front and sides the second system will usually be used. “This is a manual dotting technique, similar to a very fine tattoo pen, which allows me to blend into any remaining hair, and achieve a natural-looking hairline.” Patients normally undergo two or three treatments, each four weeks apart, to get optimum results, but the nature of the technique – placing pigment into the skin – means that you can see a distinct difference straight away. Borciani reports that anecdotally, the effect can last up to two or three years, with a maintenance session often required around 15 months post procedure. “There are factors that affect the longevity, such as sun exposure, lifestyle and general skin condition – oily skin doesn’t retain the pigment as well – but if patients look after their scalp, they should be happy for more than a year,” she says. 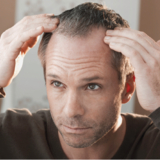 Hair loss for both sexes can be an emotional event and a source of great insecurity. The manifold treatments available can offer a solution, and as techniques become more sophisticated, they will undoubtedly produce increasingly better results. Scientists have been researching the potential to grow human hair using stem cells, whereby stem cells can turn dead hair follicles into healthy ones, and consequently promote new hair growth.18 The point in time when not only human hair can be grown in human tissue, but also when the science is routinely applied in clinics, may be closer than we think. The Maitland Clinic, Balding truth about hair loss in the UK, 2015. Data on file via The Maitland Clinic. Rossi A, Cantisani C, Melis L, Iorio A, Scali E, Calvieri S., ‘Minoxidil use in dermatology, side effects and recent patents’, Recent Pat Inflamm Allergy Drug Discov, 2 (2012), pp.130-6. Lucky AW, Piacquadio DJ, Ditre CM, Dunlap F, Kantor I, Pandya AG, Savin RC, Tharp MD., ‘A randomized, placebo-controlled trial of 5% and 2% topical minoxidil solutions in the treatment of female pattern hair loss’, J Am Acad Dermatol, 50 (2004), pp.541-53. Olsen EA, Dunlap FE, Funicella T, Koperski JA, Swinehart JM, Tschen EH, Trancik RJ., ‘A randomized clinical trial of 5% topical minoxidil versus 2% topical minoxidil and placebo in the treatment of androgenetic alopecia in men’, J Am Acad Dermatol, 47 (2002), pp.377-85. McClellan KJ, Markham A., ‘Finasteride: a review of its use in male pattern hair loss’, Drugs, 57 (1999), pp.111-26. El-SharkawyH,KantarciA,DeadyJ,HasturkH,LiuH,AlshahatM,VanDykeTE.,‘Platelet-richplasma: growth factors and pro- and anti-inflammatory properties’, J Periodontol, 78 (2007), pp.661-9. Gentile, P et al, ‘The Effect of Platelet-Rich Plasma in Hair Regrowth: A Randomized Placebo- Controlled Trial’, Stem Cells Translational Medicine, 4 (2015), pp.1317–1323. PaulTRose,‘ Hair restoration surgery: challenges and solutions’, Clin Cosmet Investig Dermatol,8 (2015), pp.361-370. William R Rassman, Jae P Pak, Jino Kim, ‘Scalp Micropigmentation: A Useful Treatment for Hair Loss’, Facial Plastic Surgery Clinics of North America, 21 3 (2013), pp.497-503. William R Rassman, Jae P Pak, Jino Kim, Norman Estrin., ‘Scalp Micropigmentation – A Concealer for Hair and Scalp Deformities’, J Clin Aesthet Dermatol, 8(3) (2015), pp. 35-42.